Eclairs! What could be better for an elegant weekend treat with coffee. You don't have to go to a bakery for these anymore! They are surprisingly simple. The baked unfilled shells can be made in advance and frozen for several weeks or stored a few days at room temperature. Eclair paste (Pate a choux) is unique among pastry doughs because it is cooked before baking. The dough is more batter-like in appearance and can easily be piped onto a silpat liner. As the dough bakes in the oven it puffs up and large air pockets form- perfect for filling! I used vanilla pudding left over from another baking challenge. 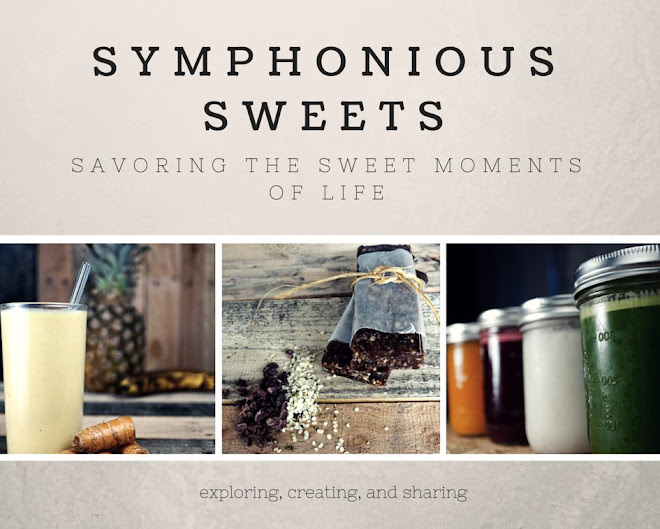 Other options I want to try are coffee pastry cream, coconut pastry cream, and a variation on the vanilla pudding using a whole Tahitian vanilla bean. Chocolate lovers could try their favorite chocolate pudding or pastry cream. I have had eclairs bookmarked in an old culinary cookbook for quit some time. I never tried them because they seemed too complicated. Then I happened to be visiting Frieda's lovely cooking blog Lovin' from the oven when she posted some cream puffs and eclairs. Her step by step photos convinced me that these might be easier to make than I had ever guessed. The recipe from Better Homes and Gardens is similar to the one in my cookbook except it gives the option of using milk. My book notes that using all water will yield a crisper shell. In medium saucepan combine water, butter and salt. Bring to boiling. Add flour all at once, stirring vigorously. Cook and stir till mixture forms a ball. Remove from heat. Cool for 10 minutes. Add eggs, one at a time, beating well with a wooden spoon after each addition. Spoon dough into a decorating bag with ½” round tip. 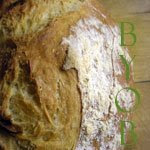 Pipe onto a silpat or parchment lined baking sheet 12 strips of dough, 4” long, 3” apart. ( I made mini eclairs about 2 inches long and they came out great) Immediately bake in preheated oven beginning at 425 F for 10 minutes then lover the heat to 400 F for another 20 minutes. Keep the oven door closed as much as possible during baking. The shells should be brown and dry inside. Cool completely then fill as desired. Vanilla Pudding recipe is over at Lovin Oven. It is quick and very tasty! It uses the whole egg unlike pastry cream which will leave you with an excess of egg whites to use up. 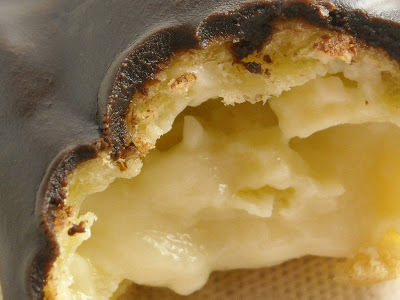 To fill cut a small hole into the end of each baked, cooled eclair shell. Pipe the filling into each shell using a piping bag fitted with a small plain tip. Be sure the cream fills the full length of each shell (I had problems getting the entire shell filled the pastry still tasted great but not every bite had enough filling.) If you are not serving these right away they can be refrigerated but serve them within 8-12 hours or they will get soggy. Melt all ingredients together over a bain marie. Remove from the heat and allow to cool until slightly thickened, stirring occasionally. 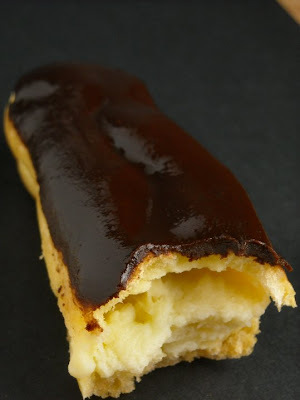 In a single, smooth stoke, drag the top of each filled eclair through the glaze. Only the top of each pastry should be coated. Finished eclairs should be refrigerated and served within 8 to 12 hours. Thanks to lovin oven for the motivation to finally try this delicious pastry! YUM! Oh DELICIOUS!!! I'm always afraid to make eclairs... I've made cream puffs, but eclairs intimidate me, especially with that lovely glaze. I want! Wow-I was not getting over the orange cake...but can we talk about these eclairs? ::swoon:: They look heavenly-nicely done! !